LG set to refresh their L-series: Rumoured specs land. LG are the one company we haven't really heard too much of since from on the mobile phone front. Last week we saw a sneak preview of the Optimus G Pro which we expect will be coming to Europe and America sometime soon! The company also teased the F-series in their earnings call and their Facebook teaser from the other day might have something to do with that! 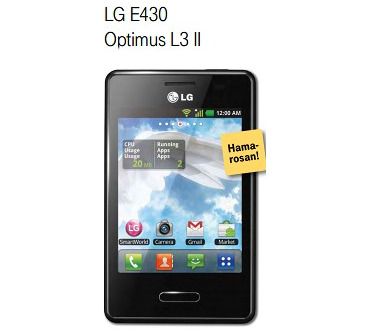 The entry-level LG Optimus L3 II, pictured above, has been spotted in a T-Mobile catalogue and the new L3 will be a considerable upgrade on the one from this year. On the inside a 1GHz CPU will drive the device which you'll interact with on an improved IPS display, which is still 3.2". The camera will be improved to a 5MP unit and if the device hits the same £50 price point it will be a definite bargain! 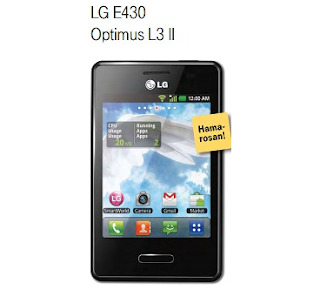 Secondly, we come to the LG Optimus L5 II. This will also rock a 1GHz Cortex-A9 CPU which will be twinned with a PowerVR SGX531 GPU, which is a huge update to the 800MHz processor in the current generation. In screen terms we're expecting a 4" WVGA, that's 480 x 800p resolution and Android 4.1.2 Jelly Bean should run the show! Lastly, we come to the LG Optimus L7 II. The biggest device of the bunch will supposedly utilise a Qualcomm Snapdragon MSM8225 1GHz dual-core processor with an Adreno 203 GPU, 768MB of RAM, a 4.3" WVGA (480x800p) display and a much better 8MP camera. All of this will supposedly be driven by a 2,460mAh battery and Android 4.1.2 Jelly Bean! The series will reportedly also offer dual-SIM variants of the L5 and L7, something which will please both travellers and people in developing countries who would want to pick up a cheap, but competent smartphone! We'll find out whether or not this rumour was right at MWC at the end of the month! It's drawing closer guys!